In August, the Frank Lloyd Wright School of Architecture found its accreditation in jeopardy, following a rules change by their regional accrediting board, the Higher Learning Commission (HLC). Now the institution needs to raise $2 million before the end of 2015, or it will lose its standing once the new rules take effect in 2017. The challenge lies in establishing the school as an entity fully independent of its parent company, the Frank Lloyd Wright Foundation. HLC, apparently targeting for-profit universities, said it would no longer offer credit to schools that are part of institutions whose “missions extend beyond academics.” As part of a foundation that also advocates for preservation and engages in non-academic pursuits, the Frank Lloyd Wright school found itself in violation of these new rules. Now the plan is to spin off the school, which earned accreditation in 1992, into a financially independent entity. To do that, the school's administrators say they need to scrounge at least $1 million in cash and pledges by March 27, and then another $1 million by the end of 2015. If they meet that goal, the Frank Lloyd Wright Foundation has agreed to make a one-time gift of $7 million. "This campaign is the only opportunity to save the Frank Lloyd Wright School of Architecture as we know it," said Maura Grogan, chair of the school’s board of governors, in a press release. If they don't reach their fundraising goal, President Sean Malone told AN the school "would remain deeply dedicated to shaping architectural education," but would lose its ability to offer accredited degrees after 2017. They could still team up with accredited institutions to offer such credentials, but their standalone certifications would carry considerably less weight in the professional world. Malone said the rules change had the unintended effect of risking the school's standing due to its unique status as a financially dependent subsidiary of a larger foundation. "It was an imperfect storm," Malone said. “Right now we're very hopeful and focused on bringing in people who believe in this cause." The Frank Lloyd Wright School of Architecture offers a professional M.Arch degree program with a focus on hands-on studio experience at its two campuses: Taliesin West in Scottsdale, Arizona, and Taliesin in Spring Green, Wisconsin. Frank Lloyd Wright, who founded the Taliesin Fellowship in 1932, can't be pleased about the latest news from the school. Architectural Record reported that in 2017 the Taliesin School of Architecture—which currently offers Masters of Architecture degrees at its campuses in Scottsdale, Arizona and Spring Green, Wisconsin—will lose its NAAB accreditation. According to Record, the Higher Learning Commission (HLC), a regional accrediting body, said it won't extend credit to schools that are part of institutions whose "missions extend beyond academics." That's exactly the case with the school and the Frank Lloyd Wright Foundation. But the foundation was unwilling to turn the school into an independent body because of a variety of fundraising-related issues. The school earned accreditation in 1992. 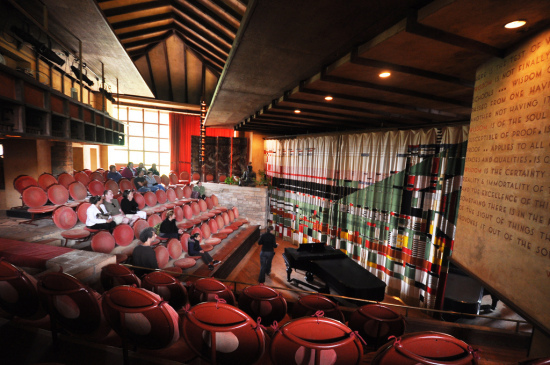 Taliesin, according to Sean Malone, president and CEO of the Frank Lloyd Wright Foundation, will now "focus on programs that don’t require accreditation, including a post-professional program that has been in the works since last year." The school may also partner with an accredited institution in the future. Students at the school—which promotes "learning by doing"—concentrate their studies on classes, studios, trips, projects, and workshops. They live on each campus and round out their studies by building and living in experimental "desert shelters" at Taliesin West and in "prairie shelters" at Taliesin. Fall and Winter terms take place at the Arizona campus while Summer terms are held in Wisconsin. 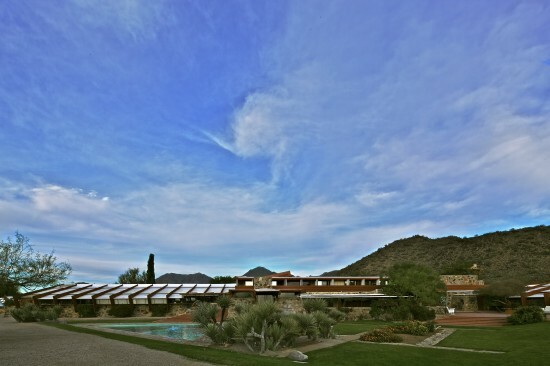 Taliesin West is currently making plans for a massive restoration by Harboe Architects. After almost eight decades of constant use, Taliesin West is ready for a makeover. 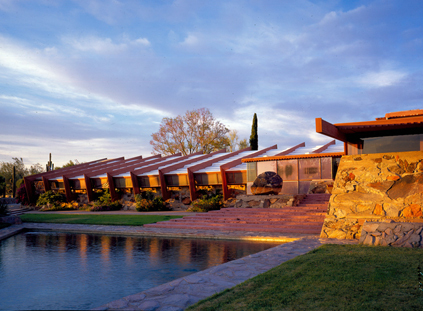 The Scottsdale, Arizona site was Frank Lloyd Wright’s winter home, studio, and architecture school. Today, the campus houses the Frank Lloyd Wright School of Architecture and is also a popular tourist destination, with over 100,000 visitors annually. Now, time, climate, and footsteps have taken their toll on the landmark. A combination of heavy use and the complex's desert environment have left Taliesin West in need of significant restoration, as well as accessibility, sustainability, and safety upgrades. As a first step towards remaking Taliesin West, the Frank Lloyd Wright Foundation has selected Chicago firm Harboe Architects to prepare a preservation master plan of the site. “[T. Gunny] Harboe and his firm rose to the top of a truly extraordinary field,” Frank Lloyd Wright Foundation CEO and President Sean Malone said. The selection committee—which included Frank Lloyd Wright Foundation staff leadership, its Preservation Committee, and a Preservation Oversight Committee made up of five outside experts—chose Harboe Architects from among more than forty contenders. “Harboe had such a remarkable understanding of Wright’s work and this particular project,” Malone said. Harboe will undertake a year-long study of Taliesin West, a National Historic Landmark site constructed between 1937 and 1959, to determine the scope of the restoration (including cost and timeline). Through research, multiple site visits, and a cultural and structural history of the location, the preservation team will answer two questions: what needs to be restored and why. “Why is a really exciting question,” Malone explained. “Part of the project is [defining a] preservation philosophy. Then once we make those decisions, that’s going to drive the decision about how.” Besides Harboe, the team also includes Michael Henry, of Watson and Henry Associates, and Dorothy Krotzer, of Building Conservation Associates. Harboe’s team faces particular challenges in preserving a site that was never meant to be static. “Taliesin West is more complicated than a lot of sites because change over time was an inherent part of the story,” Malone said. 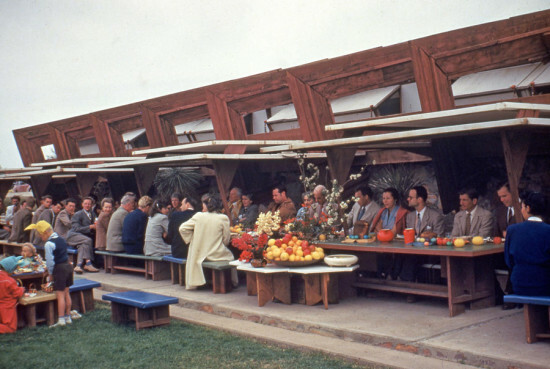 Unlike other Wright sites (except Taliesin, the architect’s Wisconsin home and studio), the Scottsdale campus was not built for one particular time. Instead, it was designed as a laboratory, a space within which ideas about architecture could develop and change. “It’s a living place. Its evolution is part of its history,” Malone said. The story goes like this: In 1949 an engineer named A.K. 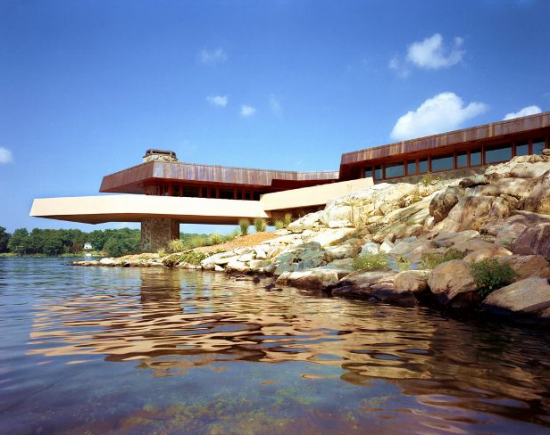 Chahroudi commissioned Frank Lloyd Wright to design a home on Petra Island in Lake Mahopac, New York, which Chahroudi owned. But the $50,000 price tag on the 5,000 square foot house was more than Chahroudi could afford, so Wright designed him a smaller, more affordable cottage elsewhere on the island. 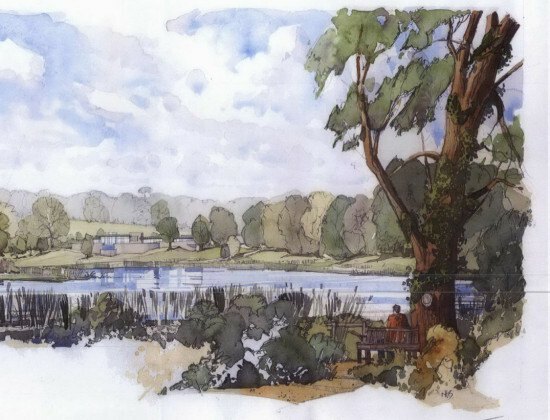 Fast forward to 1996 when Joseph Massaro, a sheet metal contractor, bought the island for $700,000, a sale that also included Wright's original yet unfinished plans. Though he says he only intended to spruce up the existing cottage and not build anything new, one can hardly fault Massaro for wanting to follow through on a home Wright once said would eclipse Falling Water. In 2000 Massaro sold his business and hired Thomas A. Heinz, an architect and Wright historian, to complete and update the design, a move that incensed the Frank Lloyd Wright Foundation, who promptly sued him, stating he couldn't claim the house was a true Wright, but was only "inspired" by him. Massaro was able to complete the house in 2004, fending off lawsuits by stating his intent not to sell. Now, however, he's ruffled the Wright Foundation's feathers once again by putting the house on the market for $19.9 million, 11-acre island included. Even though the house is not recognized by the Foundation, that hasn't stopped Massaro from listing it as a true Wright. In a statement to the Los Angeles Times he said, “You hear these purists that talk about how no unbuilt Frank Lloyd Wright house should ever be built because Frank Lloyd Wright isn’t here anymore. And then you take a look at this masterpiece of his—I’m sure Frank would rather have it built than not built at all." That may be true, but those purists are an outspoken bunch, citing four details in Massaro's house that Wright would never have approved of had he been alive to see its construction. First, the decorative "rubblestone," a Wright trademark, is not flush in Massaro's home, but protrude from the wall—a major Wright no-no. Second, the home's 26 skylights are domed, not flat, a choice Massaro apparently made citing flat skylights' propensity to leak (sealants, anyone?). Third, an exterior stairway that appears in several of Wright's original drawings was nixed by Massaro, as it would have landed in three feet of water due to the island's changed coastline. Lastly, Wrightians claim that the copper fascia are too shallow, a seemingly petty point of contention, but as Wright house owner Rich Herber pointed out, "It's the small details we'll never know about." To be fair, Massaro seems to have tried to stay as true to Wright's original intentions as possible. When the late Walter Cronkite, who knew Wright personally, visited the property he said, "I feel Frank in this house." Whether or not it's technically authentic and officially condoned by the Foundation, or the result of a Wright/Heinz collaboration, the world is probably a better and more beautiful place for the existence of the Massaro House, which interested buyers can arrange to visit to through Ahahlife.com. All images courtesy Ahahlife. A Long-Awaited Tribute: Frank Lloyd Wright’s Usonian House and Pavilion Guggenheim Museum 1071 Fifth Avenue Through February 13, 2013 In the years just before Frank Lloyd Wright’s Guggenheim Museum forever altered the face Fifth Avenue, the directors of the museum went on a charm offensive. 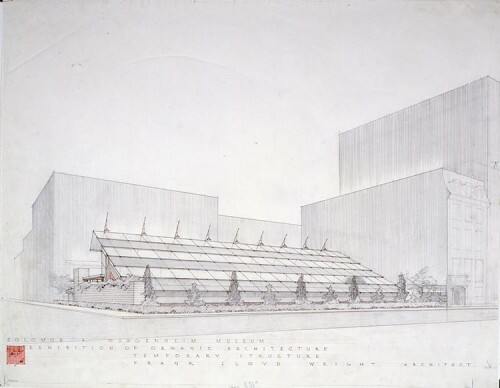 In 1953, they presented the exhibition Sixty Years of Living Architecture: The Work of Frank Lloyd Wright. The show introduced Wright’s Usonian House to New Yorkers by building the Prairie-style home on the construction site of where the architect’s tour de force museum would soon rise. Now through February 13 the museum presents a scaled-down version of the exhibition, which originally included the Usonian and a dramatic Wright-designed pavilion holding models, drawings, and watercolors by the master. This exhibition, A Long-Awaited Tribute: Frank Lloyd Wright’s Usonian House and Pavilion, celebrates the two structures that won over a somewhat skeptical New York audience to the work of America’s modern master.